FOR IMMEDIATE RELEASE: Portland, Maine (August 23, 2017) – New England Fights (NEF) will make its long-awaited debut in Portland on Friday, November 3, 2017 at Aura with “NEF 31: The Old Port.” Earlier today, the fight promotion announced the addition of an amateur mixed-martial-arts title bout to the card. Alex Walker (4-1) will take on Hilarie Rose (4-3) to crown the first-ever NEF MMA Amateur Strawweight Women’s Champion. The fight is scheduled to be contested at the strawweight limit of 115 pounds. Alex Walker is a three-fight veteran of the NEF cage. Since losing her debut in the spring of 2015, Walker has been on a tear throughout the New England MMA circuit. She has won her last four in a row with three of those victories coming by way of submission. 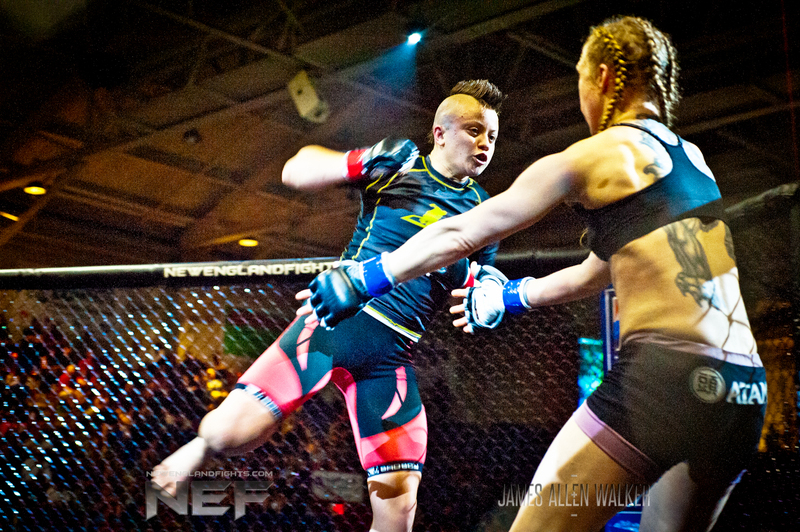 At “NEF 29,” this past June in Lewiston, Maine, Walker forced Sarah Ziehm (1-1) to tap to an arm bar. She trains with Team Kaze of Lancaster, New Hampshire. According to Walker, she is excited to have an opponent to strike with in the form of Rose. If it is a striking match Walker is looking for, she will indeed find it in Hilarie Rose. Rose, who trains at USMMA in Bellingham, Massachusetts, burst onto the local fight scene in late 2014 with an ultra-brutal switch kick knockout of Tiffany McCoy (2-1). She has won her last two fights, and Rose is determined to end Walker’s streak to become the first-ever NEF women’s champion. NEF’s next mixed-martial-arts event, “NEF 31: The Old Port,” will see the company debut in Portland, Maine at the brand new, state-of-the-art venue Aura. The event is scheduled to take place on Friday, November 3, 2017. Tickets are on sale now at www.auramaine.com.